Well, thank you very much social media! I drooled at the mere picture showcasing Cynthia Rowley‘s new cosmetic launch on Birchbox‘s IG page. Then, I went on their Twitter page and saw that gorgeous black and gold bag again… then, onto Cynthia‘s IG and Twitter accounts to see if it was truly happening and behold: Cynthia Rowley Beauty launches exclusively at Birchbox, and this literally happened on www.birchbox.com just yesterday. 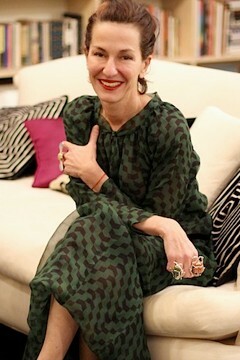 Designer (and delightfully creative and kind soul) Cynthia Rowley and Birchbox (gotta love Katia, Hayley, Mollie, Rachel, Eric…) — the company that offers customers a personalized way to discover the best in beauty, grooming and lifestyle — announced an exciting new partnership to launch Cynthia Rowley Beauty. Cynthia Rowley was the company’s first guest curator back in July of 2011, and selected her favorite products in a limited-edition box exclusively for Birchbox subscribers (Yes, I have been a client since its launch). Cynthia Rowley Beauty was inspired by Rowley‘s personal longing to create long-lasting and easy-to-use products that would solve her own cosmetic needs, and in turn her customer’s needs as well. Three spotlight products were created to focus on ideal formulas as well as applications. The Liquid Eyeliner ($18.00; available in Black Ink and Brown Ink) will be an ongoing item in the collection. It glides on ever-so-smoothly; as you can see, I was able to recreate Cynthia‘s signature logo, albeit not as crisp as print. It has up to a 12-hour hold and leaves a matte look when applied. There are also two limited-edition products within the collection: one being an Eye Shadow Palette ($24.00), which features 5 silky shadows in colors found in Cynthia‘s current ready-to-wear collection such as Clove, Sugarplum, Mink, Champagne and Patina. The last item from this current collection is a limited-edition black and gold Gilded Canvas Bag ($15.00), displaying one of Cynthia‘s most celebrated prints. These products are available now on Birchbox.com, as well as select Cynthia Rowley store locations retailing individually from $15.00 – $24.00. “Launching Cynthia Rowley Beauty with Birchbox was a natural next step for the company as we continue to grow into a global lifestyle brand,” says Cynthia Rowley. “When it comes to beauty and style, Cynthia Rowley constantly inspires us as both a celebrated designer and entrepreneur,” said Katia Beauchamp, Birchbox, Co-Founder and Co-CEO. In the celebration of the launch, customers can purchase this limited-edition collection containing the Liquid Eyeliner, Eye Shadow Palette and the Gilded Canvas Bag for $42.00 (retail value of $57.00) while supplies last. What do I always tell you beauties? The words Limited Edition and Exclusive make my heart beat fast… and this new launch does not disappoint! Just look at my eyes! They say it all! Will you beauties be getting your hands on this collection? What do you think of the designer creating her own cosmetic brand? I love the design on the bag and the eye shadow pallette as well! Beautiful! And the colors are stunning! I especially love the sugarplum and mink. And the fact that there is an eyeliner that has a small tip is nice also. Would allow me to have a small line, or a thicker more dramatic look. Is the liquid liner felt tip? Thanks! !